A whimsical accent for gardens, decks, walkways, patios and many indoor uses. 31-inch Bear with Cub Statue. This nature inspired piece is the perfect addition to any small setting; a natural accent for gardens, decks, walkways, patios and many indoor uses. Durable Comp-Cast construction. Decorative Garden Stakes, Ideal for indoor plants, gardens and many outdoor uses. Add a playful touch to your garden. Constructed from our durable "Comp-Cast, the right weight, not light weight" material, this piece is designed to provide years of enjoyment. Muskoka Gnome Statue. A whimsical accent for gardens, decks, walkways, patios and many indoor uses. Made from Comp-Cast<sup></sup>, a resilient stone, fibre and resin material that provides strength, without excessive cumbersome weight. 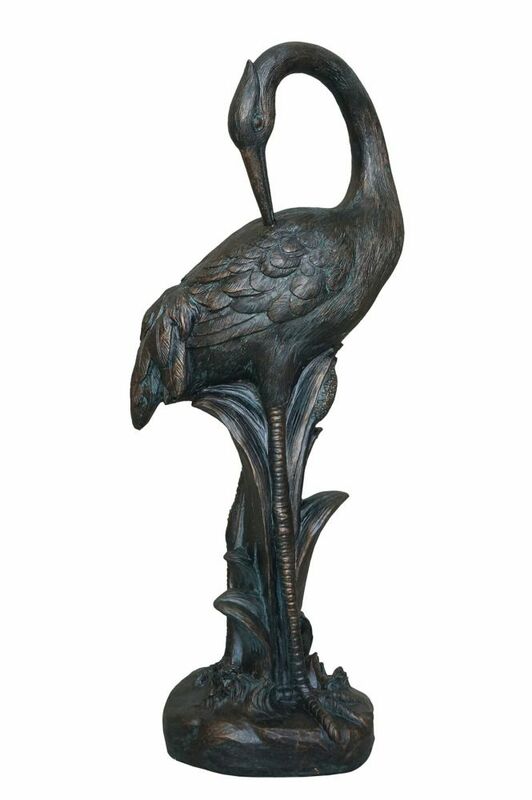 Preening Crane A whimsical accent for gardens, decks, walkways, patios and many indoor uses. Preening Crane is rated 5.0 out of 5 by 1. Rated 5 out of 5 by Nanastein from The perfect birthday gift! I received this for my 70th birthday last week. I've always wanted one but couldn't afford the metal cranes. This looks perfect near my water feature (also from Home Depot) and my potted wild grasses.